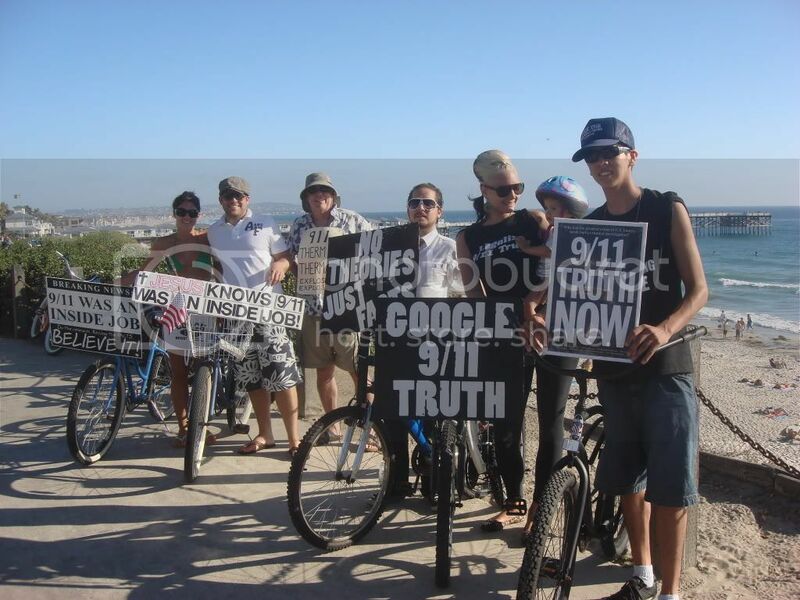 Legalize 9/11 Truth Ride (Week 7) San Diego, CA "Will the real truthers please stand up?" The Legalize 9/11 Truth Ride is a weekly ride for 9/11 Truth on the boardwalk of San Diego's beaches. We meet at 4:00pm every Sunday rain or shine at the end of Diamond Street in Pacific Beach. This event is going on its 8th week, and we have already doubled in size. On a Sunday afternoon in San Diego there are roughly 150,000 people on the beach and we reach most of them. Please join us every Sunday at 4:00pm sharp and bring your bike, witty signage, and don't forget to wear your 9/11 Truth and/or Peace clothing. Log onto www.truther.org or contact us via email at truther.org@gmail.com for more information.